Especially for commercial buildings, the representative effect of the area surrounding the building plays a major role. However, private builders also place importance on attractive grounds of their residential homes. In the meantime, there is a correspondingly great interest in products suitable for practical use all around the house which also meet upscale design requirements. 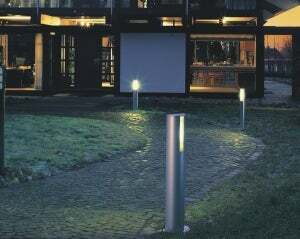 With the attractive light profile, Gira offers a solution for outdoor lighting that is both elegant and practical. The attractive light profile of powder-coated aluminium illuminates garden paths, drives, lawns or terraces and entrance areas. The light is spread so widely that open spaces and paths are well-lit. However, as an alternative a slat element can be mounted in the profile that enables the direction of the lighting toward a special area. The light is then deflected either upwards or downwards, as desired. This enables the specific illumination of plants, garden ponds or sculptures as required. A narrow light beam on the rear of the profile provides an additional orientation aid. If not only light, but also energy is required, Gira offers a multifunctional energy profile equipped with an additional device unit, instead of the pure light profile. In addition to light it also supplies energy exactly where connections are required – whether on the terrace or in the middle of the garden, whether for the electric lawnmower or the pond pump. This prevents bothersome extension cables that can also be dangerous outdoors. The device unit in the 3-gang cover frame contains three SCHUKO socket outlets with hinged covers and child protection. The Gira energy profile is also available without a light element only for the power supply of electrical devices. The light and energy profiles from Gira are available in two different sizes each with a height of 49 and 77 cm respectively. In addition, there are 140 and 160 cm high versions, which are intended for the functions of the door station from the Gira door communication system. The door station profiles can be equipped with a call button, a door loudspeaker and a colour camera. The light, energy and door station profiles designed by Phoenix Design and offered by Gira are available in the colours pure white, aluminium and anthracite. The devices and the light units are water-protected and shock-resistant. Rugged aluminium makes the profiles weatherproof, scratch and dirt-resistant, and therefore suitable for all outdoor areas. The device cover frame and the devices of the Gira energy profiles are from the Gira TX_44 theft-protected switch range. By using a base plate or (on a soft surface) an underground tube, the profiles can be installed anywhere outdoors, where connections are required and light is desired.